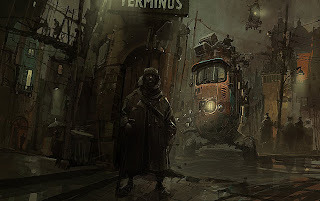 IAN MCQUE | CONCEPT ART: Hello, Good Evening, and Welcome. Greetings, viewers - thanks for stopping by. My name is Ian McQue, by day I'm a concept artist at Rockstar North, home of GTA. Within these pages I'll be posting the stuff I do when I'm not at work. Lovely stuff....do I win a prize for being first? Thanks. It's in the post. ian, i am so glad you are sharing this with us. this is inspiring work! YES! I encourage this behavior. it's a pleasure to receive a nice comment like this from a great artist like you..
i update my blog every time..i make new sketches and i'm adding you to my friends list to follow your works..
Is that the Terminus at Witherwack? Looks like it. It's amazing! Very emotional work. I like it. Rockstar should dump GTA and get to work on making a game base don these designs. You're conceptual oeuvres are so refreshing for every connoisseur !! thanks! STUNNING WORK AND BLOG !!!! !